This is a fantastic two-bedroom Barcelona apartment which is situated in a renovated building, very close to the famous Las Ramblas. Although it has been completely restored, it keeps many of its original characteristics, like the wooden ceiling beams and open-faced brick walls. Sleeping up to six people, it is ideal for a family or group of friends visiting this wonderful city. It is composed of one bedroom with two single beds (which can be made into a double bed) and plenty of storage space, and one bedroom with a bunk bed (two single beds). The dining-living room is bright with large windows. It also has two charming balconies that look out onto the bustling street below. Furthermore, it has double sofa bed and a large dining table where you can sit down to enjoy your meals. The apartment has a TV, and Wi-Fi so you can keep in touch with friends and family at home. The American style kitchen is modern and fully equipped with an oven, microwave, kettle and much more. There is also a washing machine and iron for your convenience. 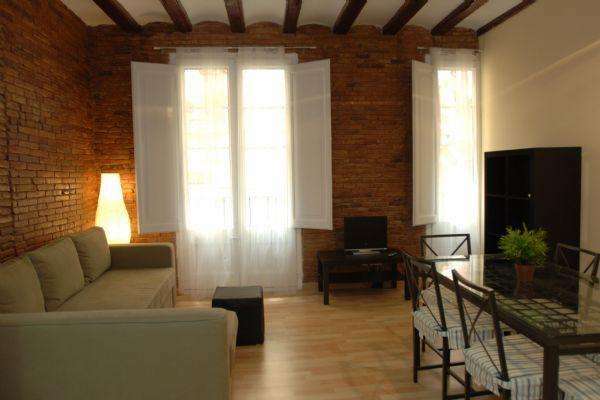 This wonderful apartment also has air-conditioning and heating, which, along with its brilliant location, provides you with a fantastic choice of Barcelona accommodation at any time of year. Please note that this apartment is for families and clients over 30 years old.